Ekman’s paper argues that the strange behaviour of icebergs comes from a balance between the Coriolis force and friction in top 100m or so of the ocean. There is a simple, and correct enough, way to think of this; the wind drags on the surface of the water, and once it is moving the water experiences a Coriolis force that deflects it to the right in the Northern Hemisphere (or to the left in the Southern Hemisphere). If we imagine that the ocean is made up of a series of slabs, stacked one on top of the other, then we have just described the wind dragging the top slab and the Coriolis force pushing it slightly to the right of the wind’s direction. This process then repeats itself; that slab drags on the next slab down, which is also deflected by the Coriolis force. Each slab moves in a direction slightly to the right of the slab above it. This is called the Ekman Spiral. Because icebergs penetrate quite a long way below the water, they are pushed by both the wind and the water. This is what makes them drift at an angle to the wind. There is a very nice illustration of an Ekman Spiral on Wikipedia, which is reproduced below. 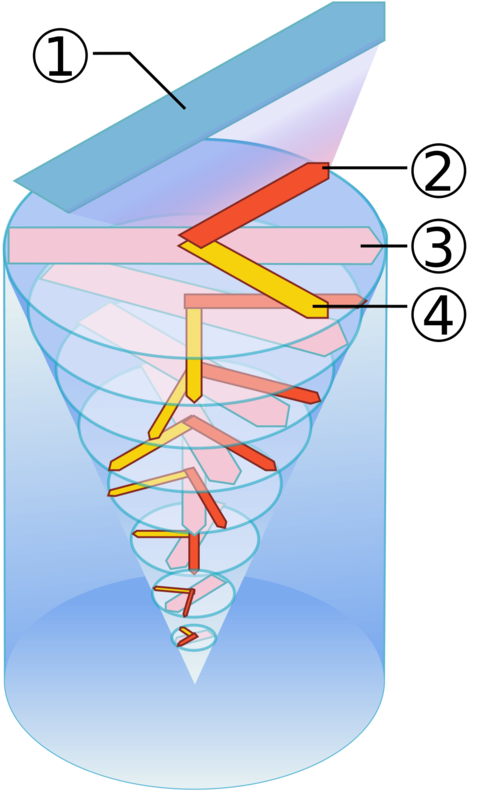 A schematic of the Ekman Spiral, from Wikipedia. To me, the most striking aspect of this is the fact that at a particular depth the water is moving in the opposite direction to the wind. Exactly opposite, anti-parallel, backwards. The energy to move the water comes from the wind, yet the water is moving in the opposite direction. Take a moment to think about that, and once you’re done, read on to find out why this is an important process in the world’s oceans, and not just of interest to iceberg hunters. The combined effect of these layers is to move water in a direction perpendicular to the wind. The water that moves away needs to be replaced. Along the equator the trade winds blow from the East. This means that Ekman transport moves surface water North in the Northern Hemisphere (to the right of the wind) and to the South in the Southern Hemisphere (to the left of the wind). Because of this, cold, nutrient-rich water comes to the surface along the equator, creating a perfect storm of sunlight and nutrients for phytoplankton. 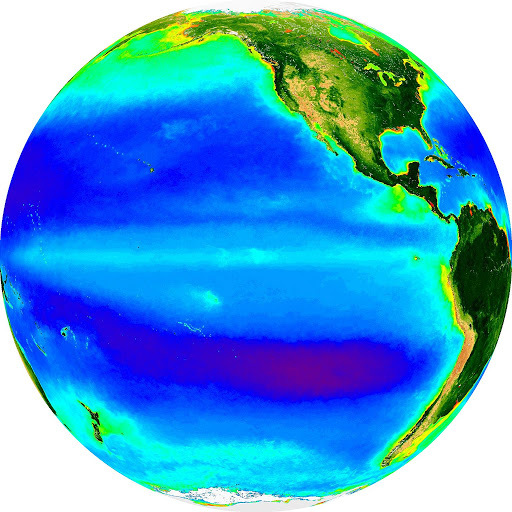 The concentration of phytoplankton can be observed by satellite, and the picture below is from the SeaWiFS project. The band of light green along the equator is due to the higher concentration of phytoplankton in the upwelling zone. Concentration of phytoplankton in the Pacific Ocean. Purple is low concentration, green higher and orange highest. Image generated using the SeaWiFS project website. The same phenomenon that causes icebergs to move at an angle to the wind is responsible for shaping the distribution of phytoplankton in the tropics.